Well, I did say that being an #NFDF2014 champion wouldn’t be all fine dining – and so it was that last week I gave my taste buds a rest and put my little grey cells to work (yes, it hurt – a bit). I’d arranged to visit some of the facilities on the Norwich Research Park (NRP) – the John Innes Centre (JIC) and The Genome Analysis Centre (TGAC) – to find out more about the science behind our food. The tour took about two hours and was fascinating (even for a non-scientist like me). In particular, I wanted to know how scientists in Norfolk are working to help farmers rise to two of the key challenges of the 21st Century: climate change and the need to increase crop yields to feed a rapidly growing global population (which is expected to rise from just over 7bn now to over 9bn in 2050). Apparently, Professor Sir John Beddington, who was chief scientific advisor (2008-2013) to the UK government, once said: “By 2030 we will need 50% more food…and about 30% more fresh water…while mitigating and adapting to climate change.” He then went on to add what could be the biggest understatement of the century: “This could create the potential for conflict.” (Source: JIC brochure.) So you can see: we face quite a challenge to maintain food security. Strange as it may seem – particularly if you only think of Norfolk in terms of Alan Partridge, old churches and turnips – the solutions to many of the challenges facing global agriculture might well be found by very clever people working not in our county’s fields but in the rapidly expanding NRP. Norfolk has a cluster of internationally respected bioscience institutes, including three specialising in plant biology (JIC), microbiology (TSL) and the production of nutritious and disease resistant foods (IFR), and one providing world-class analysis of animal, plant and microbe genomes (TGAC). Over 11,000 people, including some 3,000 scientists and senior clinicians, work at facilities based at the NRP (including the UEA’s School of Environmental Sciences and the University Hospital). Norwich ranks 4th in the UK for the number of “most highly cited scientists” after London, Cambridge and Oxford. The NRP is already home to “around 30 science related and IT businesses” and this number is set to grow when the new Centrum business centre opens sometime this year. The NRP is one of Europe’s leading centres for research in food, health and the environment. So did you know any of that? Well neither did I – and I hadn’t appreciated the full scale of the NRP facilities and the range of highly specialised biosciences being studied and applied there. Although, I had heard about the new Beneforté broccoli with its higher levels of beneficial phyto-nutrients, which was developed by scientists at the IFR and JIC and is now sold in major UK supermarkets. Sadly I wasn’t allowed to try the new, genetically modified, purple tomatoes developed by TSL scientists – but I can tell you they look delicious. Here’s a picture of me with some. They produce higher levels of the antioxidant anthocyanin and have a longer shelf life than traditional tomatoes but I will probably have to visit the USA if I want to eat them. As well as the research and training, the institutes based at the NRP are contributing to wealth and job creation, and generating high returns on the public investment for the UK economy. If you want to find out more – and to get involved in some of the public discussions you can go along to the Friends of John Innes Events or look out for Science for All events. Whatever your views on climate change – there seems to be ample evidence that global agriculture is having to cope with more extreme weather conditions (prolonged draughts, extreme floods), as well as the depletion of fresh water reserves, soil degradation, pesticide resistant pests, herbicide resistant weeds, and more virulent diseases. Finding ways to make crops naturally more resistant to these pressures would go a long way to reducing our dependence on expensive protective sprays and fertilisers, as well as ensuring our food security. One problem the scientists face is the stability of the wheat genome (particularly its Ph1 gene). This stability is a good thing because it prevents high grade wheat from randomly cross pollinating with wild varieties – but it is also a problem because it makes selective cross breeding for beneficial traits much harder. However, JIC scientists are now working on ways of temporarily shutting down the Ph1 gene to allow the introduction of important traits (such as drought or salt resistance, or nitrogen fixing root nodules similar to those found in peas) before switching it on again. JIC is also home to the Germplasm Resources Unit (GRU), which has the most comprehensive collection of small grain cereals in the UK – many free of patents and intellectual property rights, so available for study by researchers and breeders. It holds the largest UK collection of wheat and its relatives, with some 10,000 varieties, as well as 10,000 varieties of barley (including conservation grade barley that’s important to the resurgent craft brewing industry), 3,000 oats and 3,500 peas. The wheat collection includes locally-adapted primitive varieties (or ‘landraces’) which form the basis of many of our modern varieties and could hold the genetic variations needed to develop new, more productive and resilient strains. This sort of research can take many years. There are no quick fixes – you have to grow each generation of the crops to understand if the desired traits have been established. So it is good that, through the BBSRC, the various bioscience institutes on the NRP have continued to receive much needed funding. One way of speeding up such research is to develop a better understanding of the genomes of animals, plants and microbes. So the JIC, IFR and TSL scientists are mighty lucky to have TGAC’s world class genome analysis and innovative bioinformatics facilities on their doorstep. Among many other things, TGAC is currently working on sequencing the genomes of wheat, barley, rice and sugar beet to name just a few of the crops it is helping food scientists understand and develop. 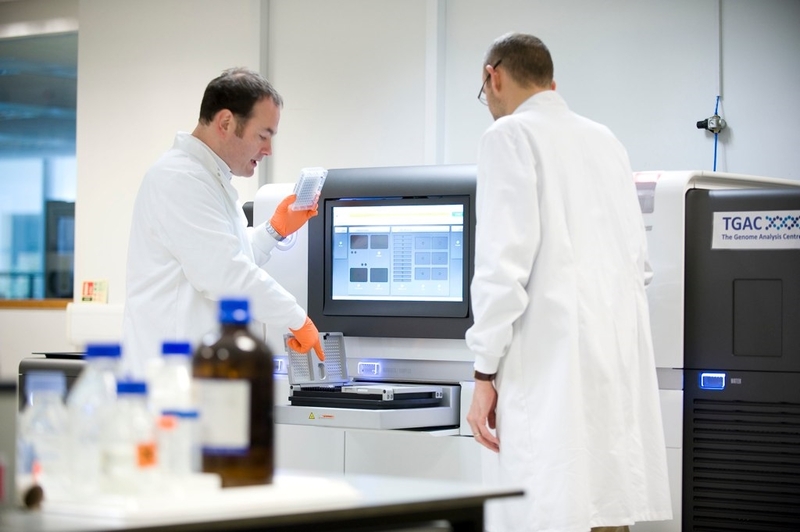 The equipment in TGAC is phenomenal – not least because of its computing power (it has a ‘3rd generation technology’ PacBio RS II Single Molecule, Real-Time (SMRT®) DNA sequencing system – one of only three in the UK). Sequencing the human genome, which is some 3 gigabases long, took 10 years (between 1995 and 2005) – but TGAC can now sequence 600 gigabases in just 11 days on just one of their platforms. That’s particularly useful when you consider the wheat genome is some 17 gigabases. TGAC Scientists working on PacBio RS II. TGAC uses a number of different sequencing technologies, depending on the nature of the work and the size of the genome being studied. First it breaks each genome down into manageable chunks to enable ‘library construction’, it then rebuilds them to perform ‘downstream analysis’. It has an optical mapping system (again, one of only three in the UK) which enables it to visualise individual DNA molecules for use in comparative genomics. As well as its work on plants, TGAC has helped Chris Packham analyse the soil in his garden, is looking at how different bacteria could make anaerobic waste disposal plants more effective, and is sequencing different strains of yeast which may benefit the brewing industry – I’ll drink to that. It also has a very good outreach programme for schools called TGAC4Kids, to encourage young scientists (aged 4-11), and the resources are free to use. And for older students (PhD and post-Doc) it is running a Bioinformatics summer school. Finally, on twitter today, I read the news that TGAC has just been awarded £1.9m of government funding for a new DNA Synthesis Unit “to support the design, generation and exploitation of high value compounds and bio-actives obtained from plants and microbes.” This is great news and further confirmation of TGAC’s vital role in the development of advanced biosciences in this country. If you get the chance to visit any of the facilities at TGAC or elsewhere on the NRP, I urge you to leap at it. If you have any questions, comments, or suggestions, please post them under this post or tweet them to me. I will do my best to reply. Look out for more posts about the Norfolk Food and Drink Festival 2014 (see my earlier post about being an #NFDF2014 Champion) and other stories from around the county. I hope you enjoy them too. This entry was posted in #NFDF2014, Local Drink, Local Food, Norfolk and Norwich, Places of interest, Science and tagged #agrichatuk, #NFDF2014, #STEM, Agriculture, Education, Food, Food Security, Genetics, Genome analysis, Science, Science and Environment, Wheat by Huw Sayer - Business Writer. Bookmark the permalink.